What a great project this has been! Back in December, Martin and I asked you to participate in a project termed “Shoot Yourself.” We’ve had some great participation and I’ve had the opportunity to see a lot of new faces in this faceless world of the Web. So here are all of the project entries, organized randomly. Additionally, the randomness will update every few minutes so don’t be surprised if these are out of order the next time you come back! I hope this works in the feed, but if you’re not seeing any photos just come on over to the site. I did this to give everybody that participated an equal chance at getting some exposure. So enjoy! And there’s more discussion below the pics. As I mentioned in the project announcement, we tend to hide behind our blogs or our Flickr profiles. We constantly share our photographic works and insights, but many of our onlookers have no idea what we look like. This project was intended to encourage you to open yourself up a bit and become more personal to your fans and friends. I’m really impressed with the level of creativity displayed here. No two photos are even close to being the same, and some of these had a lot of thought and effort put into them. Most of us may not be portrait photographers, but some of you could fool me into thinking so. You guys did awesome with this one! A few of the entries were self portraits from the past that met the criteria of the project, but many of these photos were new and they were taken for the purpose of the project. It was great to see the participants passing on word of the project, and we wouldn’t have had half as many entries without the help of those photographers listed above. As Martin and I cooked up this project idea, our first intent was to connect all the photography bloggers out there. But then we decided to open it up to other photographers using Flickr and other photo-sharing sites. This was a great change of intent, and (as you can see) we had a lot of extra participation from these folks. First, get up there and start checking out these photographers. 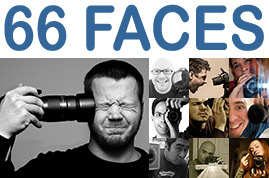 If you’re looking for some new resources on photography, look through the “Blogger Faces” section. 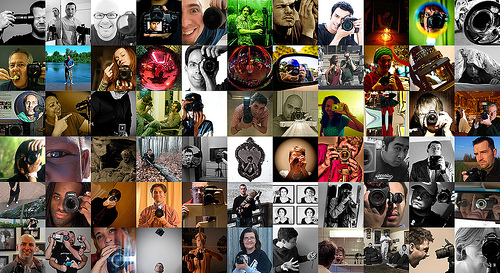 If you’re looking to connect with other photo-sharing photographers, look through the “Photo-Sharing Faces” section. For those who participated (especially the bloggers), I’ll be sending you the project photos and several versions of the code for the project listing. It’s not required, but you’re welcome to repost some or all of the project entries and share them with your readers. You could show off your favorite captures, your favorite people, or even the entire list if you want. As for me, I’ll be taking a short break before hosting the next Epic Edits project — and by short, I mean that I’ll be announcing it on January 21st. So stay tuned! This entry was posted in Features, Inspirational, Projects and tagged bloggers, camera, digital, digital photography, Flickr, foto, participate, photo, photographer, photography, photography blog, photography project, photos, portrait, project, self portrait, shoot yourself on January 9, 2008 by Brian Auer. Very cool and the turn out was great. I regret I didn’t make it 67 photographers, but circumstances did not permit. Great idea Brian and Martin! Thanks Jim! Sorry we missed you on this one, but there will probably be more projects to come! I still think that it was a cool project idea and I am so happy to see myself on your blog. Looking forward to receive the code and I’ll definitely re-post it on my blog. Nice results! Too bad my face is so ugly haha! This is freaking cool ! I just wish it would be easier to directly link a picture or a blog ! As for the photos, I’m disappointed with my effort as it’s not clear that I’m holding a camera….ah well. You live and learn right? However, I’m loving Ben Bailey’s effort – very creative. Certainly a lot of inspiration to draw from here next time I need a (self) portrait idea! This was a very creative project, Brian. It was a treat to participate, and I’m excited about any upcoming projects. I’ve posted my own recap too! Great to see all the fellow bloggers and photographers who are regulars here. And who said that photographers can ham it up. these shots are great. It looks great! I can’t wait to get home this evening so I will have time to look through everyone’s entries. Please add me to the list of people that needs the code. I used Flickr because my blog is set up by weekly themes, but I would definitely like to post a recap on my personal blog and Houston Photobloggers. Wow, awesome results. I’m going to be spending my day adding new sites to my bookmarks. Brian, fantastic response and some amazing photographs there. I’ll post the code on my blog (which is not photo-heavy) as I’ve already plugged the project, this blog, and Martin’s Flikr/webpage. Looking forward to the next project!! Wow that was totally rad. Sure a creative bunch of people there. I will be posting it on my blog sometime today as well. Thanks for letting me participate, and for holding this contest. I am going to have a blast going through all the entries. Wow, I wake up and there’s a ton of great responses! You guys are awesome! Hopefully some of you will make a few new connections because of the project — I know I have! Away from the computer for a little while and all of a sudden there is this great post about all the awesome photographers. I am so behind and will try and catch up as I sit in the Kalamazoo airport awaiting my flight to Chicago. Great project Brian. I am very excited to visit all of the photographers who participated. Hey great response! Awesome Idea…. But I don’t see the site/photo I submitted anywhere…perhaps it got missed? Scratch that! I refreshed and then I found it! I posted it on my blog, I had to resize the images just a tad to fit properly, but it’s up. Hey Brian, thank you (and Martin of course) so much for this great project! It’s been fun and still is, seeing that I haven’t even started looking closely at all those people’s work, blogs, photo sites. I’ve already had the first contacts with some of the lot! Greetings around, too. I’ve republished some of the portraits on Keen Eye, though my portrait above is linked to my German photography blog. This was is a really cool idea, and I’m glad I’m part of it. I’m looking forward to adding a whole lot of new feeds to my reader. It was fun and an honor to be part of this project. I think the idea of building and developing the photographer community is a fantastic goal, and I look forward to exploring all the new photo blogs and photo collections. I hope i’ll be able to make new friends and forge relationships! this project turned out so well! I’m happy to see my face up there. Martin directed me to this contest and this way I found your blog. Thank you two for setting this thing up. A very creative crowd hangs out with you! This is great – I love all the different perspectives and personalities! Pingback: What Should Our Next Project Be? Great photography site. I love the concept of Shoot Yourself. If time would have permitted, I would have loved to have entered my own piece to the project. I will be checking back for more interesting updates, thanks.